The Lincoln Stars got out to a quick 3-0 lead and cruised to a 5-2 victory over the Des Moines Buccaneers Tuesday evening at the IceBox. The win snapped Lincoln's three-game losing streak. The win improved Lincoln's record to 4-6-1 (9 points), good enough for 8th place in the USHL western conference. Click here to view the current league standings. Through the prior 10 games this season, the Stars were plagued a bit by slow starts, but that certainly wasn't the case Tuesday night against the Bucs. I thought the Stars came out strong and played with a sense of urgency that I hadn't seen in a long time. They seemed to forecheck more aggressively (especially in the first period) than what I've seen in the past, which was refreshing. The Stars didn't give the Bucs a chance to think before they had a body on them, separating them from the puck. Michael Gillespie got the party started with his 8th of the season (leads the Stars) on a 3-on-0 with just under five minutes remaining in the first period to give Lincoln a 1-0 lead. Stars took that 1-0 lead into the first intermission, leading on shots as well, 14-10. It was a relatively quiet first period (1 goal, 1 minor penalty), but that all changed in the second period with five total goals scored (four of which were on the powerplay), and 46 penalty minutes whistled. Biagio Lerario made sure the Stars wouldn't start slow in the second period with his fifth goal of the season scored exactly one minute in. The next four goals scored in the middle stanza were all on the powerplay. Both teams were getting a little chippy with their play, so the refs really got whistle happy at this point. Joe Lappin scored his first as a member of the Lincoln Stars (his first official USHL goal as well) at the 3:34 mark of the second period with a nice, quick PP wrister to give his team a commanding 3-0 lead. Lappin's goal proved to be the eventual game-winner, also. At this point in the second period, the Stars were clicking on all cylinders. However, the Bucs stopped the bleeding (temporarily) at the 8:17 mark with a 5-on-3 powerplay goal to pull within two goals at 3-1. Ryan Jones answered just a few minutes later for the Stars with his first goal in a Lincoln Stars uniform which gave Lincoln a 4-1 lead. Jones' powerplay goal came on a blast from just inside the blueline, which beat Des Moines goaltender Ryland Pashovitz. Immediately after the Jones goal, Pashovitz was pulled by the Des Moines coaches in favor of goaltender Ryan Ruck. With just over two minutes remaining in the wild and crazy second period, the Bucs scored a PP goal to pull back to within two goals. Stars took the 4-2 lead into the second intermission. Shots were 10-7 in favor of Des Moines in the herky-jerky, whistle-filled second period. The lone third period goal came on a nice odd-man rush by Stars forwards Michael Gillespie and Max Humitz. Gillespie brought the puck into the offensive zone and showed tremendous patience before threading the puck at the last second to Humitz who was able to tap it into the open net. Stars lead 5-2 at this point and would carry that score until the final buzzer. The Stars went 2-for-5 on the powerplay, while the Bucs went 2-for-6 with the man advantage. In regards to the powerplay, I thought Lincoln did a much better job being mobile while in the offensive zone. I didn't see a lot of standing around. Being more mobile created some quick odd-man opportunities in which the Stars were able to manufacture goals. Stars goaltender Peyton Jones was solid between the pipes, stopping 30 of 32 to notch his 2nd win of the season. A quality performance by Peyton last night. Apart from the two PP goals against (and one was a 5-on-3 goal), he shut the door on the Bucs at even-strength. 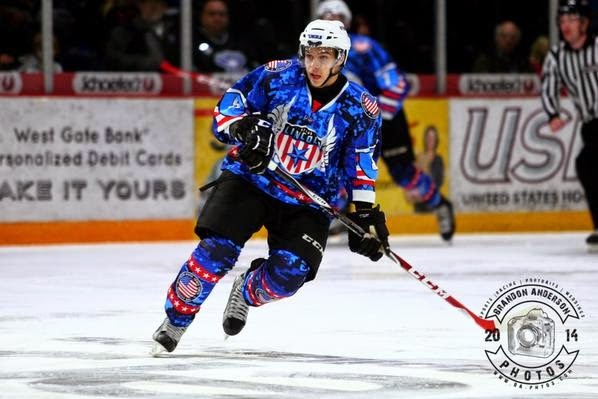 The Stars wore military-themed jerseys last night in honor of Veteran's Day. Proceeds from the jersey auction (the Stars reported $7000 was raised) went to the Student Veteran Organization at University of Nebraska. The Stars will go on their longest (in miles) road trip of the season this weekend when they take a 16-hour bus ride to Youngstown, OH to battle the Phantoms. In another weird scheduling quirk, the Stars and Phantoms will play Friday night in Youngstown, and then on Sunday. No game on Saturday. More on that long road trip later in the week. 7,000 seems quite low...last year I was at the jersey auction game and I remember some players jerseys going for 3,000 each. The year before that I think shines was 4,000. Any idea on the amount raised last year for each auction? The fact that this game was on a cold, Tuesday night didn't help attendance. Less people in stands = less money raised. Plus, the $7000 could have been the money raised after you take away the cost of the jerseys. Just a guess on my part. The end of the year MDA jerseys are always the top sellers. The mid-season jerseys (American Cancer Society, and now UNL Vets) normally are on the lower end. Some of it could be that it was a silent auction, too. The public ones tend to see the egos and prices rise correspondingly.